Peron’s appearance at the balcony of the presidential palace at the Plaza de Mayo on 17 October 1945 was one of the greatest moments in Argentine history. Why? Because it ushered in the new and powerful Peronist movement that was most radical in this regard: it gave voice to the people. Those words that Peron proclaimed on October 17 articulated his deepest belief that the people must hold the reigns to the might and power of the land. Robben in his scholarly work “Political Violence and Trauma in Argentina, states: “Peronism in its essence rested in the dialogue between Peron and the crowd. Peron voiced and personified the genuine will of the people (15).” As a caring and insightful leader, Peron was able to address the root of the problem, the greatest human violations his countrymen were enduring. According to Amnesty International Report: “the indigenous remain among the most marginalized and poorest communities, discriminated against and often exposed to grave abuses of their fundamental rights (Clearly 65). By mobilizing these underdogs, the indigenous people of the land, Peron was able to create a cohesive social structure that was effective because it was powered by the people as they coalesced as a movement with a vision for social change and a rally cry for justice. In Cleary’s article, “Indigenous Rights Resurgence,” we grasp the greater picture of this grassroots mobilization effort as the author has carefully traced “the trajectory of social and cultural policies towards indigenous peoples in Latin America” and summarizes these tactics as based on the indigenous: “an ideological movement that denounces the exploitation of aboriginal groups and strove for the cultural unity and the extension of citizenship through social integration and acculturation (58).” This rights-based movement had grand ideas and it also had a plan. Peron’s two stated goals were social justice and economic independence. He implemented his vision by instructing his economic advisors to develop a five-year plan aimed at increasing workers' pay, achieving full employment, stimulating industrial growth of over 40% while diversifying the sector (then dominated by food processing), and greatly improving transportation, communication, energy and social infrastructure in the private, as well as the public sectors (Rock, 1516). Thus, a revolution for change was sparked and fueled by a visionary leader and citizens that were ready to take on this new ideology of human rights for each and every individual. Sadly, oftentimes blissful times linger for just a little while. Sweet, but all too short. Such is the tale of the Argentina people. On July 1, 1974, Peron suffered a heart attack and passed away. His death signaled the end of socially just rulership. His wife, Isabel Peron, succeeded her husband, yet she was incapable of properly ruling the land and her term ended on March 24, 1976 by a military coup d’etat. A military junta led by Jorge Rafael Videala took control of the country and established authority by an iron fist of command. He swiftly instated the infamous National Reorganization Process, a systematized persecution of the Argentina people. According to the tenets of what was termed “Operation Condor,” Decree 2772 stated: The Armed Forced, under the Supreme Command of the President of the Nation delegated to the Defense Council, will proceed to execute the military and security operation necessary to annihilate the actions of the subversive elements throughout the country’s territory. 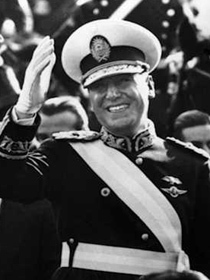 The Argentine military interpreted Decree 2772 as a blank check to kill, execute, or assassinate anyone who challenged the new governmental structure (Robben, 192).” Immediately the Peronist movement began organizing itself, the members empowering each other with their high ideals and vision of social justice. Yet their peaceful protests were shut down and members began to suddenly ‘disappear.” Guerrilla groups thus took action. The dirty war was in full swing. This war, however, was not simply waged upon those with hand grenades and tools of violent revenge, but upon those with the dangerous and insidious ideas of freedom for all. General Chasseing stated: “I am much more worried about about an ideologue than a combatant; the combatant is dangerous because he destroys, because his bomb may end many lives. But the ideologue is the one who poisons, who robs children, who destroys the family, who may create chaos ( Robben186).” Who were these dangerous ideologues? Jamie Swart, a Minister of the provincial government of Buenos Aires, denounced as ideologues “politicians, priests, journalists, professors on all levels of education. Everyone who was involved in any sort of political activism, everyone who called publicly for social justice could be branded as an ideologue. Sympathizers were all those feeling an affinity with the utopian ideals of the revolutionary left (Robben 187). This Process of National Reorganization, intended for Argentine society as a whole, was being enacted on the souls of the its captives. As the below photos reveals, those who did not submit to the new order, whose hearts resisted this utter subjugation of the citizen were shackled, dragged away, and never heard from again. They are called the disappeared. The revolutionists who will never be forgotten. Stay tuned for the next report uncovering the dirty secrets of this brutal war-- brought to you by Ava Munson, University of Washington. Robben , Antonius . Political Violence and Trauma in Argentina. Philadelphia : University of Pennsylvania Press , 2005 . Brysk , Alison . The Politics of Human Rights in Argentina . Stanford : Standford University Press , 1994 . Rock, David. Argentina, 1516–1982. University of California Press, 1987. Bellum , "Dirty Wars: A Primer ". A Project of the Standford Review . 07/19/10 . "Les éphémérides d'Alcide ". Retour . 07/19/10 < www.lessignets.com/.../ calendrier/sept/19.htm>.